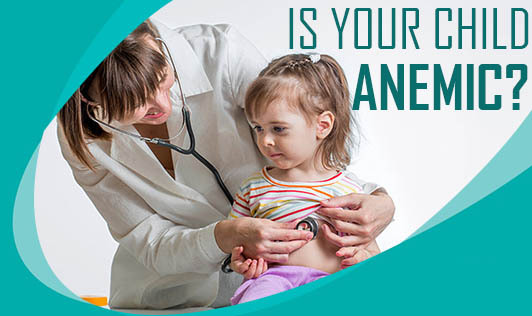 Does your child look weak and falling ill often? If yes then your kid may be suffering from anemia. Anemia refers to reduction in the number of Red Blood Cells (RBC) in the body. Red blood cells contain hemoglobin that carries oxygen to the body tissues. Anemia is usually temporary and caused due to nutritional deficiency or blood loss. Severe anemia can be life threatening. • Anemia caused by inadequate RBC production can happen because of inherited defects, or iron deficiency or if your child is not eating anything else and drinking only milk (as milk is a pro-source of iron). Iron deficiency anemia is most often seen in children below 2 years of age and in menstruating girls. • Deficiency of folic acid and vitamin B12 can also cause anemia which is mostly found in children who consume little or no folic acid rich foods. • Anemia caused due to increased blood loss can happen during accident or surgery, injury or with the blood's ability to clot properly. • Hemolytic anemia is caused due to the destruction of RBC's. The life span of RBC's is 120 days. But for a hemolytic patient it would be much less than 120 days. This might be a result of antibiotics, snake or spider bite, sun burn or chemical exposure. A complete blood count along with blood smear, testing for the blood iron level, and bone marrow aspiration to check cell production can be done. Different types of anemia are treated differently. If your child has anemia due to iron deficiency, then the doctor may prescribe an iron supplement or adding iron-rich foods in his diet like red meat, egg yolks, yellow and green leafy vegetables and tomatoes can help.